Is the city of Makati ready for e-jeepneys? Are we really enjoy substantial benefits from a very light implementation, like the mayor has claimed? "Because of the e-jeepney we were able to reduce smoke-belching problems... and that was able to give an answer to our problems of air pollution," Makati mayor Jejomar Binay told Agence France-Presse on board one of the mini-buses recently. With only 15 servicing Makati, compared with 60,000 licensed traditional jeepneys across all of Metro Manila, Binay may have been overstating the environmental benefits in his enthusiasm for the project. True that it does not need diesel anymore (therefore no air pollution), but with dry spells affecting the country every summer, owners cannot sufficiently recharge their vehicles (for about 6 to 8 hours) when there are rotating blackouts nationwide. 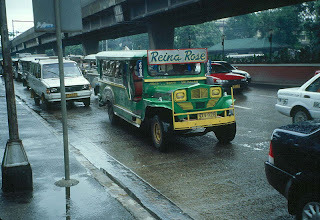 A traditional jeepney can accomodate more than 20 passengers while the e-jeepney only a dozen people. Doing simple math, that means a total replacement by around 100k e-jeepneys. The article fails to enlighten us the cost to build one e-jeepney. I'm betting it is pricey. Another problem stated in the article: smooth roads needed. Federation of Jeepney Operators and Drivers Association of the Philippines president Zeny Maranan questions the durability of the e-jeep. To put it short: implementation of the e-jeepney system requires smooth roads, massive roads, and newer sources of power. This requires massive state funding, something unlikely (though still possible) to happen.